Full-service grooming is available at our Lincoln Way Animal Hospital office located in Upper Sandusky, Whetstone Animal Hospital located in Bucryus and our North Central Veterinary Services office located in Sycamore. Our groomer, Rebecarose, has been grooming since 2011 when she began her training at Tolles Career and Technical Center. She came to our clinics in May of 2016. 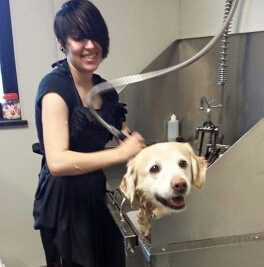 Not only is Rebecarose an experienced groomer, but she is also trained in animal behavior which allows the pets to have a good grooming experience. She is available Monday, Tuesday, Thursday, Friday and Saturday. Call our Upper office at 567-257-3500, our Bucryus office at 419-562-0027 or our Sycamore office at 419-927-2568 today to schedule an appointment!